Hunstrete Lake, at almost 5 acres, has always been recognised for it’s high quality sport with the emphasis on carp and tench. Many anglers have achieved their personal best carp here with loads of double figure commons and mirrors as well as a good number of “twenties” and a few “thirties” as well. 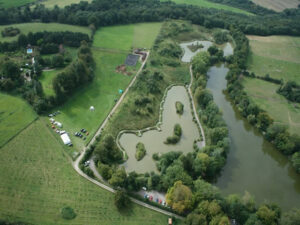 The lake is also a favourite with tench anglers with large numbers of 4 to 6lb fish and a fair number from 7 to 10 lbs. plus. Bream to over 8lbs and roach to 1¾lbs also feature; as well as pike to 22lbs. There are 41 custom built comfortable swims or platforms.